Think jumper dresses are just for little girls? Not anymore. Ladies' jumpers are back in style, and though they're perfect year-round, they're especially cute for fall. Paired with tights, leggings, and a long-sleeved shirt underneath, these dresses are a comfortable, casual fashion statement. You can find jumper dresses for women online at big box stores, boutiques, and even Amazon. If you prefer to shop in person, be sure to check at the department stores near you for the best chance. At the mall, don't be shy about popping in at some of the trendier stores that target teens and early 20-somethings, even if you're a little older. The Ms Stunner Women's Sleeveless Houndstooth Dress, available for under $20.00 in burgundy, grey, and coffee. Sizes range from XS (0-2) to XL (18). This one is inexpensive, but be sure to note that you'll need to hand wash it in cold water instead of just tossing it into the washing machine with a load of your other clothes. The ROXY Women's Chase the Sun Jumper Dress is available in a warm yellow shade called Curry, in sizes X-Small to X-Large for around $40.00. It's a polyester material with a suede-like feel, and it, too, will need to be hand washed. The straps and buckle add visual interest and adjustability. This style is eligible for free returns. The NONOSIZE Women's A-Line Casual Overall Denim Dress comes with a zip front and pockets. You can get this one in sizes XS through 3X for around $40.00, and it's even machine washable. It's mid-length and you get free returns on some orders. Be sure to check the size chart to make sure you get the right size; reviewers say it runs large. 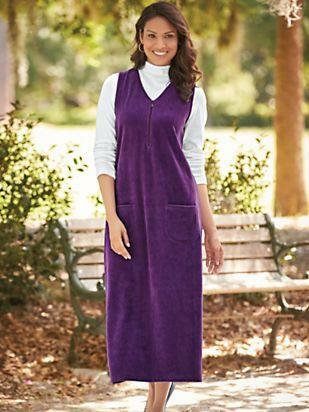 If you love the modesty of a longer jumper dress that hits below the knees, Old Pueblo Traders may have the one you're looking for. They are known for having unique designs, and if you join their loyalty program, you save ten percent off all your purchases. New email subscribers get free shipping, otherwise shipping starts at just under $7.00. The Jumper by Koret® comes in size small through 3X and is available in khaki, navy, and slate gray. The hem hits below the knee and the skirt has an A-line flare to it, complete with inverted pleats. Button details add subtle visual interest, and it zips up the back. Expect to pay less than $60.00. This dress can be machine washed and dried. The Knit Velour Jumper is available for less than $60.00 in deep green, mulberry, or red. Misses sizes range from small to XL, and petite and women's sizes are also available (small through XL and 1X to 3X, respectively). This dress is 100 percent cotton and can be machine washed, but it will need to be line-dried. You can save quite a bit at Overstock, and jumper dresses abound there. If you join Club O, the rewards and loyalty program, you'll receive five percent back in rewards on all your orders and enjoy free shipping. Free standard shipping is also available for orders over $45, otherwise expect to pay just under $5. The Live A Little Women's Brown Plaid Zip Front Dress is ideal for fall, with its warm tan and brown tones. It has a retro feel, and you can get it in small, medium, or large for less than $25.00. Other than the zipper on the front, two zip chest pockets make this one stand out. For something similar but maybe a little more versatile, there's the Live a Little Women's Tan Corduroy Zip-Front Dress, available for just under $30.00. Get it in sizes Small through X-Large. This is a solid, not a print, so you may be able to experiment more in what you pair it up with. Tan corduroy is also great for fall. The Live A Little Women's Olive Sleeveless Long Jumper is another solid style, this time with a little more length on it. It features two pockets at hip-level and button detail at the shoulders. It's available in Medium, Large, or X-Large for about $20.00. If you have a Neiman Marcus near you, you could find your jumper in person and try it on before making a purchase. If you do have to shop online, take comfort in the fact that they offer free shipping and free returns. The Eileen Fisher Lightweight Viscose Jersey Jumper Dress comes in black and is available in sizes X-Small through X-Large for just over $200.00. This one is the epitome of casual comfort without sacrificing style. This is a slipover style that hits below the knee, and it even has pockets at the sides. The scoop neckline isn't unusual for a jumper dress, but the racerback is. The Chloe Wool Crepe Jumper Dress is also available in black. This one is a bit shorter and is more of a splurge at over $1300.00. It's made of virgin wool and lined in silk, and features buttons up the front along with patch pockets. The deep square neckline makes this option stand out in a sea of scooped necklines. This style is available in French sizing from 34 Fr (size two in the US) to 44 (US size 12). Blair has quite a few modest jumpers for women. Shipping starts at just under $7.00, although new subscribers can snag free shipping on their first order. If you sign up for a Blair credit card, you can receive coupon offers for free shipping and earn rewards dollars. The Corduroy Jumper is available in an attention-grabbing royal purple or deep teal in small, medium, large, XL, 2XL, and 3XL. It's less than $50.00 and you can wash and dry it with ease, so there's no ongoing cost or inconvenience when you purchase this one. There's no need to hand wash or dry clean it. Layer it over your favorite tees or turtlenecks and enjoy the longer, mid-shin length when it's cool outside. The Cotton Corduroy Jumper sounds similar, but it has a button-down front and comes in Navy, Chestnut, or Boysenberry. You can get petite sizes (small through 2XL), misses (small, medium, or large), or women's sizes (XL, 2XL, or 3XL). It's 100 percent cotton and can be machine washed and dried. It features two pockets at hip-level in the front and the hem hits below the knee. With any jumper, there's usually going to be some layering involved. These dresses are made to be worn over a separate top. They're usually worn over a simple tee, mock turtleneck, or turtleneck. If you're wearing a jumper in a solid color, you can choose a patterned shirt, leggings, or tights. Patterned jumper? Embrace all the possible solid colors that could go with it. Black and white tops are always a possibility, but be sure to check the jumper's pattern for any colors that are easy to overlook (thin stripes in a plaid, for example) and bring those out with your top or tights. Because they're especially popular in materials like corduroy and frequently seen in fall colors, they especially lend themselves to cool weather days. That means you can dress them up with patterned tights (or bright solids). Choose pumps, flats, or a pair of boots (any height, from ankle to knee). These are a classic for women. The hem length and skirt style will be up to you, as will the material you choose. You can find jumper dresses that hit above the knee or mid-calf. Skirts can be straight or flared, and materials range from denim to velour or corduroy. Jumpers are versatile enough for any woman to own one to wear in casual situations.